The Perks Of Being A Wallflower was a highly popular teen novel. 13 years after the book was first published, the movie was finally released. Yes, no movie can have the exact same impact that the books they’re adapted from have, in my opinion, but it’s still a great adaptation. Charlie (Logan Lerman) is just starting his freshman year of high school and he has absolutely no friends. The only person who really seems to understand him is Mr. Anderson (Paul Rudd) who then introduces Charlie to many new classic books. He then encourages Charlie to now go out and truly live your life instead of just silently watching everyone. His no friends issue all changes when he meets a senior, Patrick, (Ezra Miller) and his gorgeous step-sister Sam (Emma Watson) who then change his life forever. This isn’t your typical coming-of-age story. It’s very open and it doesn’t beat around any bushes. This is a film that covers more or less every tough teen topic that you can possibly think of, but it’s done in such a tasteful and respectful way so it really works. The story itself is well-developed and from start to finish, we get to watch these extremely fascinating characters gradually grow up. The balance of both drama and comedy is a little bit strange, but Perks isn’t short of short but nevertheless funny moments. Logan Lerman was impressive as Charlie, the awkward protagonist who would rather sit back and watch people live their lives than actually live his own. I had my doubts when I first heard he’d be playing this role, but he certainly exceeded my expectations. Emma Watson was charming as ever as Sam, the girl Charlie takes an instant liking to. Ezra Miller is the comic relief as the hilarious Patrick. He says exactly what he’s thinking and somehow, it always manages to turn out funny. The performances from the parents were about as good as you expect. They don’t get much attention since this movie is focuses specifically on teens, not parents. I think that Chbosky was ultimately the best choice to direct and write the screenplay for this heartwarming film. After all, it’s his story that he’s telling and I love that this ends up shining through his actors and actresses. Anyway, the directing was just all around sharp and it’s pretty much impossible not to like him or at least to respect him. Basically, the shots taken were simple enough, but still managed to be beautiful in the end. This was an amazing book/movie about finding your place in the world and discovering who you want to spend your time with. 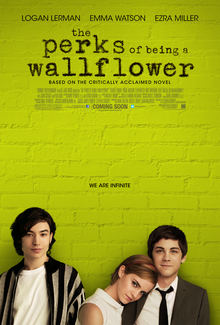 Charlie ever hardly leaves his house until he meets Sam and Patrick, who make his world fun and who make him “feel infinite.” The movie will surely please audiences and give them an interesting perspective on what it’s like to be considered “a wallflower.” This is the type of movie that affects you in a way that you can’t even begin to describe.